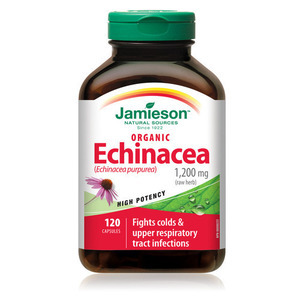 The upcoming topic on the Natural Health Show is the common cold and Echinacea (Jamieson Laboratories). This is not surprising since we have entered the flu season. Of course many of you may say that it’s sufficient to get a flu shot. But as I explained in my previous blog on the topic it’s not as simple as that. Each year the influenza virus undergoes mutations which make some strains invulnerable to the vaccine. Some individuals are also allergic to the vaccine. Furthermore there is a period of increased vulnerability to infection from the time of taking the vaccine to the time of antibody production. This period usually lasts about a week and during this time we have a higher chance of getting sick if we are exposed to the real virus. So what are the natural ways that we can enhance the immune system and prevent the cold? Well a lot ofnatural remedies were mentioned in my previous blog, but here I want to talk specifically aboutEchinacea. It is a nice purple flower with a longer then average stalk commonly growing in our gardens during the summer period. The three main sub-species are E. purpurea, E. angustifolia and E. pallida. The most common sub-species in a supplement form is the E.purpurea. All three produce none or only very minor side effects in a very small proportion of the population. The most common one being upset stomach….Read more…. Categories: Immunity | Tags: echinacea | Permalink.